Happy birthday, Nellie Bly, rock star journalist! 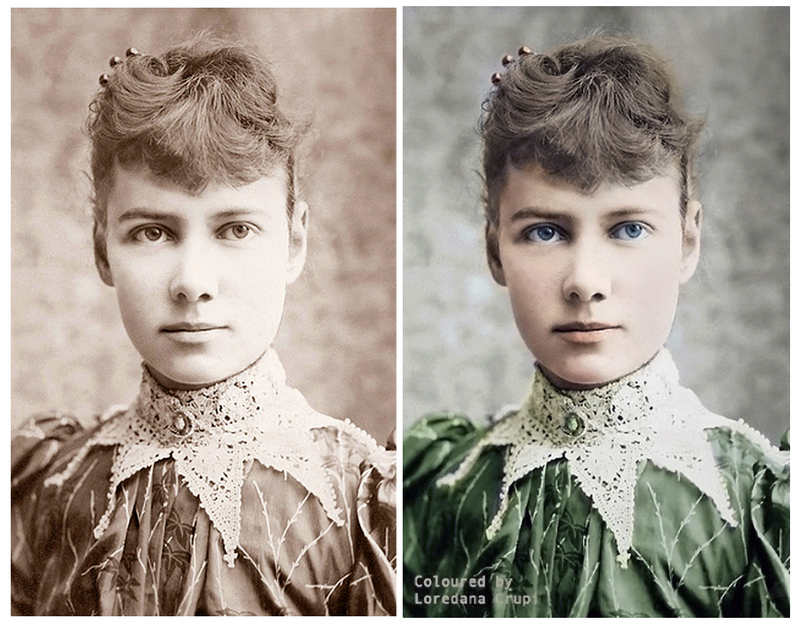 Nellie Bly. This coloring is done by Loredana Crup. On a dreary winter night in Pittsburgh, 1885, a dispirited father wrote the Pittsburgh Dispatch asking what to do with his five unmarried daughters. The paper responded with an editorial explaining that women were only good for housework, and that America must have sunk pretty low if a father didn’t have time to find suitable husbands for his daughters. On January 25, a 2000-word letter to the editor came in from “Orphan Girl.” The letter, titled “The Girl Puzzle,” had a pretty simple suggestion: give girls the same opportunity as boys. The astonished editors at the Pittsburgh Dispatch demanded that the author identify herself. They were soon introduced to the 20 year-old Elizabeth Jane Cochrane. But the world would soon know the Dispatch‘s newest journalist by a different name: Nellie Bly. Bly may have been a trailblazing feminist in the cigar-chomping era of male journalism and an early muckraker of the Gilded Age, but most impressive about her is how spellbindingly her stories hold up well over a century later. She was a New Journalist many decades ahead of her time – inserting herself into ludicrous situations, handled with humor, frankness, and highly sensible internal monologues. She became the protagonist of her stories, so that readers could feel closer to society’s larger ails on which she reported. During her race around the globe her own journey became the stuff of international legend. If Nellie Bly were here today, she would annihilate the competition at The Moth’s Story SLAMs. Article in New York World. Image courtesy of NYU. 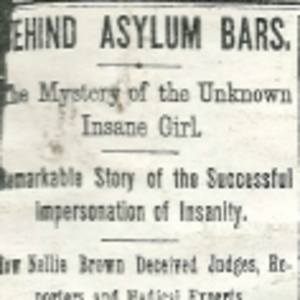 Take her first masterpiece, “Behind Asylum Bars,” written in 1887. Like so many young aspirants, Nellie showed up in the big city with dreams that were immediately kicked to the curb. After four months in New York she had no job, having gotten only a few freelance assignments, and was fast running out of cash. She smooth-talked her way into the offices of the New York World, then the biggest paper in town, offering to write about whatever they wanted. An editor suggested that she sneak into Blackwell’s Island, a frightening collection of insane asylums and prisons on today’s Roosevelt Island. “They all look crazy,” I asserted again, “and I am afraid of them. There are so many crazy people about, and one can never tell what they will do. Then there are so many murders committed, and the police will never catch the murderers,” and I finished with a sob that would have broken up an audience of blasé critics. She gave a sudden and convulsive start, and I knew my first stroke had gone home. Nellie terrifies her roommates at the boarding house, berates police officers for not finding her “lost luggage” and finds herself in court before an overly sympathetic judge, who looked upon the well-dressed young woman and lamented, “I am positive she is somebody’s darling.” (The judge’s dead sister apparently looked just like Bly.) Bly got herself committed to Bellevue, where, having convinced a phalanx of doctors that she was indeed insane, she was put on a boat to Blackwell’s Island. It would be her home for the next ten days. If Nellie Bly were Kobe Bryant, the New York World would be her Phil Jackson, a mad genius operation perfectly designed to harness and nurture her mad genius. The World, helmed by Joseph Pulitzer since 1883, was rewriting the rules for sensationalism, and was rewarded with the country’s biggest circulation, the first newspaper to crack a million copies sold daily. Bly’s story probably would have been a hit anywhere, but the World fed the hype, leaving readers hanging just as her boat heads for Blackwell’s Island. After this story, Bly became one of the World‘s only journalists to consistently receive her own byline, and the paper supported her maverick schemes, letting Nellie be Nellie. I will resist the urge to summarize Bly’s ten-day incarceration, which is many pages long. Why subject you to a cover version when you can go on the Internet and read the original? Ultimately her story caused such a stir that new funding and reform measures were enacted to reduce the misery at Blackwell’s Island. A more amusing tale especially bears telling this week, as New York State Senate Majority Leader Dean Skelos has been arrested for corruption, fulfilling his destiny as a New York state political leader. In Bly’s “King of the Lobby,” she puts on a marvelous act as a dumb, rich wife of a medicine manufacturer. Seeking out Edward Phelps, New York’s most legendary lobbyist, she promises him large sums of money to stop a bill that secretly both she and he know has already been stopped. 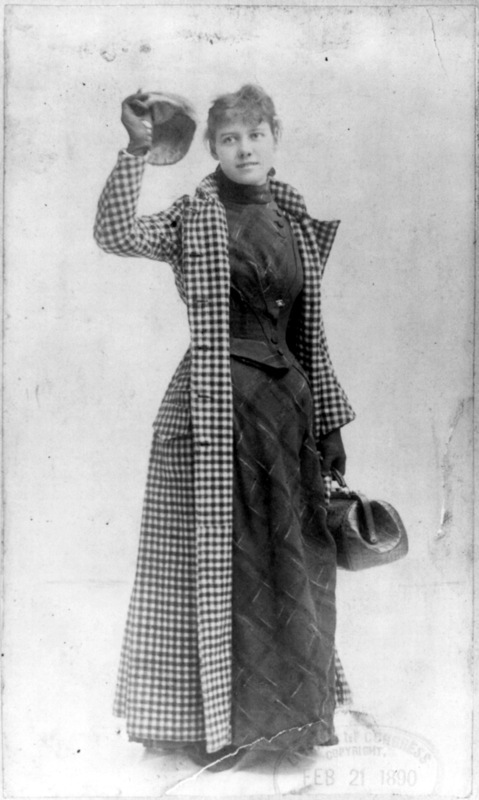 Bly in 1889, rocking the outfit she wore around the world. During this era of gender oppression, for a woman to succeed in a man’s profession was itself an act of feminism, whether or not she explicitly advocated for equality. Bly did both. Her subjects ranged from the political, such as her spotlight on Belva Lockwood, the first woman to run for president (Equal Rights Party, 1884), to more whimsical social issues, like whether women should propose to men (Bly “Advances Arguments in the Affirmative.”). Remarkably, 120 years later, Hillary Clinton remains the first and only woman to be seriously considered for the presidency, and women are generally still not expected to propose. “Do you think women should propose? Anthony and Sacagawea may soon be joined in the female currency caucus by Harriet Tubman, who would replace Andrew Jackson, surely the weakest of the regularly used bills, though McKinley ($500) and Cleveland ($1,000) are no hot shakes either. I have never met the man or woman yet who was not aroused by that answer into doing their very best. 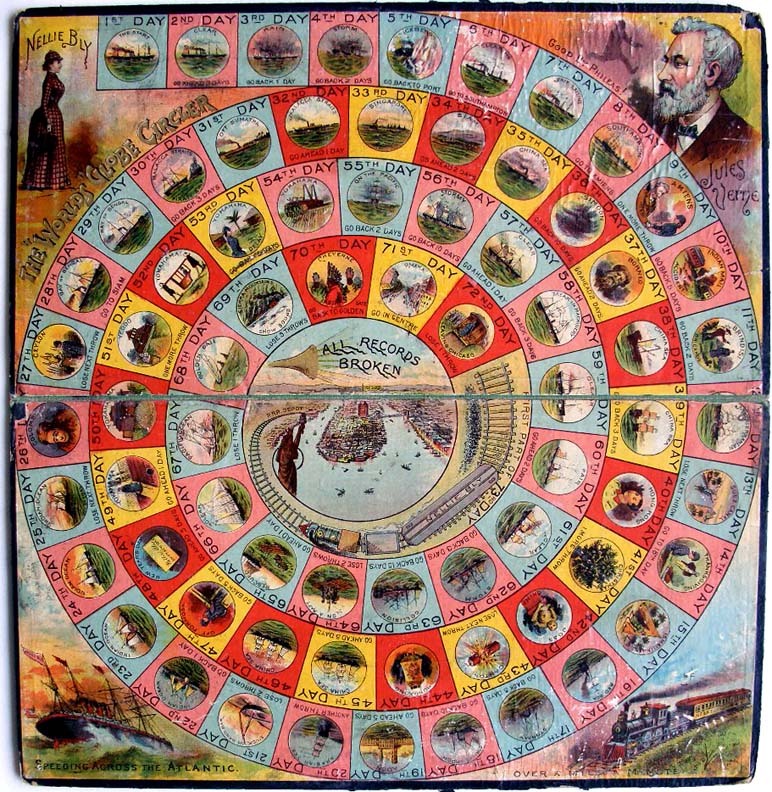 A copy of the Nellie Bly Trip Around the World board game. The world was a very different place in 1889. Obviously we all know that intuitively, but how many contemporary accounts have we read? A whip-smart, educated, largely untraveled journalist with a habit of saying what’s on her mind, with all the cultural sensitivity you would expect out of a white American in 1889, Bly is a less sanitized guide than a history book, and she offers a mesmerizing, jarring portrait of an unconnected Earth. In Italy she has to explain where New York is to a cable operator. In the Gulf of Aden she buys ostrich eggs from Jewish boat merchants and compares Somali boy swimmers to flying fish. She was delayed for five days in Sri Lanka, thought by some at the time to be the inspiration for the Garden of Eden, and in Singapore she buys a monkey, who accompanies her the rest of the way. I won’t spoil the ending (you can read the whole series here), but by the time she lands on American shores, with an entire railroad line devoted to her quest, she has become an international celebrity, enormous crowds greeting her at every station. In perhaps the most poignant moment of the journey, she meets the French-speaking Jules Verne, and the pair, by candlelight in Verne’s library, silently trace Bly’s route across the world on a map containing Phileas Fogg’s. The World, ever the faithful cheerleaders, ran updates relentlessly on her progress, offered a free trip to Europe to whoever could get guess her exact arrival time to the closest minute, and even created a board game based on her trip. Bly’s last cause was using her advice column to find orphans foster homes. She died in 1924. But today we celebrate her birth. Happy birthday, Nellie Bly! You turn 151 today. Thank you Google, for giving Bly a much deserved shout-out, and thank you, Yeah Yeah Yeahs front-woman Karen O, for the nice ditty. The professor who penned the foreword to Bly’s collected writings said that every semester students contacted her wanting to learn more about Bly, and that those students were universally female. Hopefully, after today that will no longer be the case. And as far as this little site is concerned, in addition to all of Bly’s other accolades, she is an easy call as a Hall of Fame New Yorker. ← Today in NYC History: Welcome to the 1939 World’s Fair! “Hall of fame New Yorker,” for sure. Great post!